Season chicken breasts with kosher salt and fresh cracked black pepper. Add a couple of tablespoons of extra virgin olive oil to your skillet. Add the chicken and cook until it’s about 3/4 done, meaning you’ll see the edges of the chicken turn white with just a little pink left on the top middle. This will ensure a good sear. 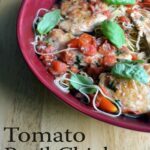 Flip the chicken over and add in the fresh tomatoes that you have chopped up.